In what could be Apple's largest single outside investment since its acquisition of Beats, the company is supposedly in discussions to put up around $3 billion toward Bain Capital's bid for Toshiba's memory chip business. Citing sources familiar with the matter, Bloomberg reports Apple is in talks to provide capital to Bain for an equity stake in Toshiba's chip business, a move designed to shift sentiment away from a group backed by Western Digital. Toshiba is looking to offload its memory chip unit to offset more than $9 billion in losses tied to its U.S. nuclear operations run under the brand Westinghouse. In order to remain listed on the Tokyo Stock Exchange, Toshiba needs to raise funds by March 2018, but the chip business sale is woefully behind schedule. Apple's new commitment convinced Toshiba to sign a memorandum of understanding with Bain as the firms work toward inking an official agreement this month, the report said. For Apple, the decision to back Bain is in part due to the strategic importance of Toshiba's memory production resources, sources said. With a stake in Toshiba, Apple would secure a constant supply of flash memory, a valuable commodity component used in iPhone, iPad and other devices. The importance of consistent flash memory supply was evidenced this week when Apple raised the price on high-capacity iPad Pro configurations. Toshiba selected Bain's consortium as its preferred bidder in June, with an offer of 2.1 trillion yen ($19.1 billion) on the table. At the time, the state-backed Innovation Network Corp. of Japan and Development Bank of Japan were part of Bain's group, though both pulled out in the face of legal threats from Western Digital. Japan's Ministry of Economy, Trade and Industry later pushed Toshiba to take a counter offer from a consortium led by U.S. equity firm KKR that includes Western Digital among its members, the report said. Confusing matters, Toshiba and Western Digital jointly run a chip factory central to the memory unit deal. The two companies fought over the facility in a pair of lawsuits earlier this year. 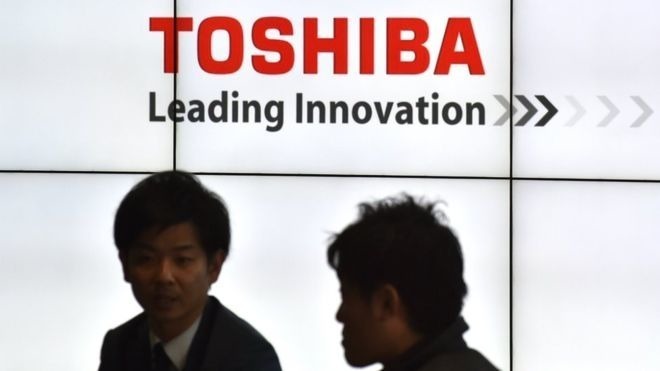 Western Digital was first to lob allegations of illicit distribution of trade secrets against Toshiba, with the Japanese company firing back claiming Western Digital was attempting to interfere with the sale process. A Reuters report in late August seemingly corroborates some of today's claims, but had Apple ponying up $3.6 billion as part of a Bain bid worth around 2 trillion yen. Most recently, the Nikkan Kogyo on Monday said Toshiba had accepted a 2 trillion yen bid from Western Digital's alliance, but Reuters refuted the report, saying talks had stalled. Instead, the publication said Toshiba was favoring the Bain-led group which includes Apple, Dell Inc., Seagate Technology and SK Hynix. Seemingly out of the running, at least for now, is a consortium led by Foxconn. That group, to which Apple is also attached, last week proposed a $19 billion deal that would give Apple a 20 percent share of Toshiba's memory division.